BB and I were out for dinner last night with another couple. It was at a mid-range restaurant. The location was beautiful, on the water. I had a mixed greens salad and a New York steak. My choices with the steak were garlic mashed potatoes or roasted Yukon Gold potatoes. I chose the roasted potatoes and boy was I disappointed. What came was not at all what I was expecting. What comes to mind for roasted potatoes? Nicely browned, crisp on the outside, nuggets of deliciousness. What did I get? 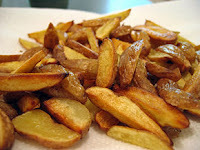 Wedges of potatoes that resembled crescent shaped french fries that had been cooked through enough not to be frozen any more. Yuck. I guess they tried to make up for it with the 5 pieces of green beans that were about 3 inches long. This meal was not cheap. What do you think? Is this what you would expect when ordering "roasted Yukon Gold potatoes"?